Shigeru Yamada knows he’s lucky. Of millions of illegal immigrants, he got a green card through a rare legislative feat known as a private bill. The beginning of Yamada’s story is as extraordinary as its conclusion: he came to the U.S. as a boy from Japan. His mother died in 1995 in a car accident, three months short of obtaining citizenship, halting his legal path to immigration. When Yamada was about to be deported two federal legislators from California, Rep. Bob Filner and Sen. Diane Feinstein, got involved. 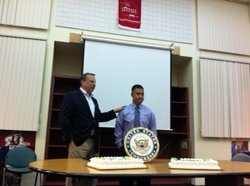 Photo by Ruxandra Guidi, KBPS: Shigeru “Shiggy” Yamada celebrated the bill that granted him legal residence in the U.S. With him is Rep. Bob Filner. Today a copy of the private bill granting him residency, signed into law by President Obama last December, hangs on his living room wall. “I get to see it every single day,” he said with a smile in an interview at the Lasik eye clinic he manages in Mission Valley. “I owe my life to both Congressman Filner and Senator Feinstein,” he said. Filner, who represents southern San Diego County and Imperial County and is running for San Diego mayor, has sponsored 20 private bills in the past three legislative sessions, more than anyone else in the House of Representatives. What does that say about him as a legislator? Those involved in the private bills say they are a way for Filner to draw attention to causes that matter to him — such as immigration reform and civil justice — and to positively impact people’s lives. They also can earn the loyalty of a large or influential group of constituents. Drafting the bill is easy enough for an intern to do, and the payoff is considerable, Williams said. “The congressman gets the reputation for being a nice guy, helping people.” If the bill isn’t acted upon, he “can simply blame other congress people,” he added. Filner declined numerous requests from inewsource to be interviewed about his private bills, but in a brief conversation with a reporter at a campaign event earlier this month, he said that private bills are a way of getting results in Washington and helping people in difficult predicaments. In contrast to public bills, which affect the general population, private bills are intended to help individuals facing uncommon hardships. They have been around since 1789, when George Washington signed the first into law. Most focus on immigration. Since revelations that congress people were trading private bills for bribes in the 1970s, they have become rarer. Lawyers who have sought private bills for clients said they truly are last resorts. “If an attorney has another way to win, they’re not going to try to get a private bill,” said Carl Shusterman, a Los Angeles immigration attorney who said he had one signed by President Bill Clinton in 2000. Members of congress are selective about what private bills to sponsor, and few pass. Bills for Yamada and another immigrant, the widow of a U.S. Marine originally from Japan, were the first to be signed into law since 2004. Most of the 20 private bills Filner sponsored in the three most recent congressional sessions were intended to help immigrants stay in this country legally. Two proposed to help a Fernando Javier Cervantes, who came to this country when he was a child, enlisted in the Army, and faced deportation because of a methamphetamine possession conviction. The latest bill is pending in the House Committee on the Judiciary. Another immigration case, involving two sisters living in San Diego, is now in two House committees. Aluisa and Ledia Zace came to the U.S. as refugees from Albania. When their refugee status expired, their father was deported and they became involved with local and national immigration reform activists. In 2009, they were sent to the George Bailey County Detention Facility in Otay Mesa for deportation. They declined to be interviewed, but Rabbi Laurie Coskey, who contacted Filner on their behalf, said a “perfect storm” of factors led him to sponsor the private bill. Filner has also sponsored private bills directed toward civil matters. One attempted to extend the term of a patent for a prescription drug that helps to treats bladder infections. Johnson & Johnson sold the drug, and the inventor worked at the University of California San Diego. The bill died in a committee. Teresa Trucchi, an attorney in San Diego, represented three U.S. citizens who are subjects of private bills related to civil justice. All three men were jailed in Mexico after police found drugs accidentally left in cars sold to them at U.S. federal and customs auctions. The men have unsuccessfully sought compensation from the federal government. Trucchi believes Filner “could see the inherent injustice” in the cases but also was concerned that the U.S. government left the drugs in the vehicles. “There’s a broader reason [Filner got involved]: so that it doesn’t happen again,” she said. For Yamada, his green card means joy — and the absence of fear. Maybe he reached out to the right person at the right time, maybe it was his support network. Yamada said his case came to Filner’s attention through hundreds of letters, phone calls and faxes from friends, family, teachers and sympathetic groups from around the country. Yamada wishes the fate of others wasn’t so unpredictable. Roxana Popescu is a San Diego-based freelancer and contributing writer at inewsource.